Reigning World Champion and two-time World bronze medalist Evan Lysacek has appeared at Skate America five times. When he makes his sixth appearance at the event, Nov. 12-15, in Lake Placid, N.Y., it could be his first time winning a gold medal at the competition. 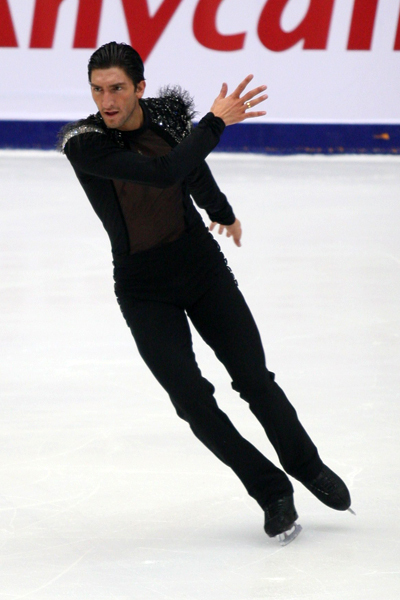 Lysacek won three consecutive silver medals (2005-07) before taking the bronze medal last season. “I always enjoy skating at Skate America because of the amazing crowd that the event draws but it has never been my best competition,” the three-time U.S. Champion said earlier this year. To open the Olympic season, Lysacek won the Cup of China silver medal in Beijing, China, behind Japan’s Nobunari Oda. He scored 232.17 points, about 10 points off the personal best he set en route to taking the World title in March. Before leaving for Lake Placid, which hosted the 1932 and 1980 Winter Olympic Games, Lysacek chatted with Figure Skaters Online’s Jamie Blanchard about Cup of China, Skate America and beyond. The first part of the interview [Lysacek: ‘I don’t want to be perfect today’] was published Thursday. I know that you have skated in Beijing a few times before. But what was it like being there after the 2008 Olympic Games? It was really cool to be back in Beijing. Having my Olympic season start where the summer Olympics were was really special. The rink still had Olympic logos and all of the signage up. It was a really cool feeling to just be surrounded by that. It was really inspiring. Last summer I was at home watching all of these amazing athletes compete and all of these special moments take place, thinking that maybe this year it could be me that people are watching. It was really inspiring. It also made me realize how quickly everything is going. The Olympic Winter Games are coming up really quickly. How are you handling the pressure of this Olympic season? A good friend of mine [gymnast Nastia Liukin] won a gold medal in the Beijing Olympics. I have been talking to her about the experience of being in the spotlight at the Olympics and how she handled it. In Torino, I didn’t have that much pressure on me because I was still pretty inexperienced and no one expected that much from me but this time around, it is very different. I have to have a different attitude, a different outlook on the whole experience. I know that people have expectations and I have expectations myself this time. So I’m just talking to as many successful [Olympians] as I can about their Olympic experiences. I’m gathering as much information as I can. I’m trying to really learn from people who have been there before. Hopefully everyone’s advice and stories will prepare me for Vancouver. Looking forward to Skate America, are you happy to be going back for a sixth time? I’m really excited because it is one of my favorite events of the year, every year. I already have that connection to the event since I have been doing it every year since 2004. It feels good to be going back there even though it is a little different since it is not the first event of the season. It is my second stepping stone instead of my first so I hope to perform a little better than I usually do. I’m also happy to be skating at the event in its 30th anniversary because I think that just shows the prestige of Skate America. It’s also kind of cool that it is in Lake Placid, N.Y., this year because that is another Olympic location. Like I said about Beijing, it is really inspiring for me to skate in some place where the Olympic spirit is so strong. Its motivating when you think of all the moments that happened in Lake Placid like Miracle on Ice. Also, a lot of the Ralph Lauren clothing for the Team USA athletes in Vancouver is inspired by Lake Placid’s Olympics [in 1932 and 1980]. All of the clothes have that vintage look that Lake Placid has. I think that’s a cool connection between the past and the future. Lake Placid is at a much higher altitude than where you train outside of Los Angeles. I was training in Lake Arrowhead, Calif., before leaving for China, to help build my stamina so I don’t think that the altitude in Lake Placid will really affect me too much. I’ve skated well in high altitude before but I wanted to cover all of my bases. I wanted to have a little room to relax. Knowing that I have been in Lake Arrowhead recently makes me feel better. Are you comfortable with where you are at heading into the event? Yes, I am really happy about how I started the season in Beijing. I’m probably the happiest that I have ever been with the start of the season. I’m really confident about where it will go from here. I think I have a good idea of what I need to do to keep getting better as the season goes on. I love the programs that I have. I think both my short program and my long program are really interesting. I’ve had my long since the summer but my short program is just over a month and a half old but. [The short is] still new but I feel really comfortable in the skin of that program already. I feel like the two programs I have this season are great for me. They have made me push myself in a new direction. But I think there is obviously some room for growth. Hopefully they’ll be better after Skate America. “Scheherazade” by Nikolai Rimsky-Korsakov, are different than what you have done before. Were you nervous to put the programs out there? I was very nervous to skate my new programs for the first time. Actually, it is probably better to say that I was more anxious about it than nervous. I think the anxiety came from not just putting hard work into them but also having to show my own character. I feel like this is the first time that I have two athletic programs that are also really artistic and intricate. I think it is like an artist who just finished a painting. They are happy to have finished the masterpiece but they’re hesitant to show everyone. They’re hesitant to open it up to the world. I feel like my new programs were my painting. I was a little anxious to put them out there for everyone. I really wanted to do a really good job with this year’s programs so I was nervous with how they would be received, like a painter would be with his paintings. I wanted to show a different dimension to my skating. I feel like my choreographer Lori Nichol and I were really able to do that. Both of the programs have a lot of character. I honestly feel so proud of both the short and long. It sounds like you’re in a great place. I know there is work to be done but I feel good about the season. Thank you so much for taking the time out to answer questions. Is there anything that you would like to add? Thank you to everyone who has been supporting me and my skating. I really appreciate all of the e-mails, letters and Facebook messages of encouragement. I am so grateful that I have an amazing group of fans. Thank you to everyone. It means a lot to me. I hope to see you all soon. • For the first part of the interview, click here.